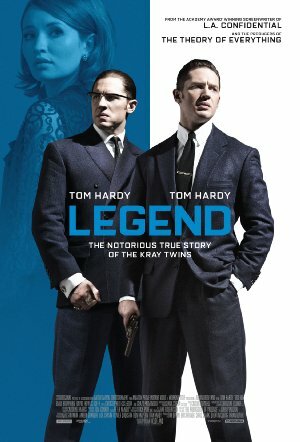 Tom Hardy has the difficult task of playing twin brothers Ronald and Reginald Kray in the film Legend and he is more than up to the task. The Kray twins were gangsters in London’s East End and this film concentrates on their exploits during the 1960s. Both had boxed in their youths and this was something that would be part of their violent natures throughout their lives, although Reg was the brains and Ron the true muscle. They owned clubs, ran protection rackets and they wanted to ‘rule’ London. Reg has a driver/gofer named Frankie (Morgan) who has a non-twin sister names Frances (Browning). Reg meets Frances and falls in love. She has no desire to be involved with a gangster and tries to convince Reg to go straight. During a prison stint early in the film, she makes this very clear to him and he promises he will never again be in prison. Ron has been incarcerated as well, and it takes some machinations to get him out of the asylum to which he has been committed. He’s a bit of an odd duck, clearly well-read but a bit of a doofus in other ways. He’s also clearly out of the closet and not ashamed to admit his homosexuality. He is very close to Edward “Mad Teddy” Smith (Egerton) who is also part of the Firm, which is the name of the Kray’s gang. After a war with a rival London gang, the Krays begin to expand into the tonier areas of London and they draw the attention of the American Mafia. Meyer Lansky dispatches Angelo Bruno (Palminteri) to negotiate a deal with the Kray twins to partner in gambling, money laundering and other nefarious enterprises. Eventually they wind up owning Esmeralda’s Barn. Reg brings in a ‘fixer’ named Leslie Payne (Thewlis). He has connections but Ron doesn’t trust him one iota. Their world becomes a hurricane of violence against which the backdrop of the love between Reg and Frances tries to work itself out. Brian Helgeland’s fifth feature film isn’t quite as brilliant as some of his prior works like 42 and A Knight’s Tale, but it is a very good movie. It is taut and mixes in an excellent mix of laughs, drama and violence that isn’t gratuitous. The few exterior shots aren’t overly long or self-serving, while the interiors are just beautiful to see. Many actors have portrayed twins in the past. Sometimes for humor as done twice by Jean-Claude Van-Damme and by Jackie Chan in martial-arts movies. Sometimes in truly awful fashion as Lindasy Lohan, Adam Sandler and Eddie Murphy demonstrated. In fact, Adam Sandler won Worst Actor and Worst Actress Razzies for his twin roles in Jack and Jill. Occasionally we see one actor portraying twins brilliantly as done by Leonardo DiCaprio, Christian Bale and Nicolas Cage. Tom Hardy’s work here compares favorably with the best of those. The nuances he creates in differentiating between the two Kray twins is simply astonishing. He is ably aided by superb work from Emily Browning and the rest of the cast. This isn’t a perfect film but it is easy to view and a lot of fun to experience. For the curious, some spoilers follow solely for the purpose of articulating the differences between the real story of the Kray twins and what we see in this film Read on only at your own risk. The movie portrays Ron Kray as a homosexual. In fact he self-identified as bi-sexual and was married twice to different women. Although it seems to have lasted longer, only eight months passed between the marriage of Reg Kray and Frances Shea, and her leaving him. That happened in 1965 and she did not die until 1967. The film shows her committing suicide and that was the ruling of the coroner’s inquest. However an ex-lover of Ronnie Kray and one of his cellmates both claim that Ron confessed to killing her in a jealous rage. The newspaper that alleged Ron Kray had an affair with Robert Lord Boothby not only retracted the story, but paid Lord Boothby a settlement of 40,000 pounds. This is why the Conservative party had no interest in investigating the Krays. There are also rumors that Ron Kray had a sexual relationship with a Labour Party MP (Member of Parliament), Tom Driberg and this is why the Labour Party also had no desire to open that particular can of worms.